It’s not that surprising to hear that customer insights are the foundation of B2B marketing and sales success. What’s not as well known is how marketers can increase what they know about customers and use that information to drive their businesses. 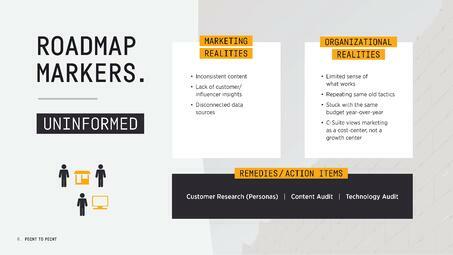 The marketers who have the most to gain by doing this are those we call “Uninformed Marketers,” the least sophisticated of all marketers, according to our recently published Digital Marketing Roadmap. Uninformed marketers are not particularly aware of their target audiences’ needs or their behaviors. The organization can’t predict how customers will respond to its outreach efforts or content, nor can it segment its customers depending on their level of engagement or stage in the buyer journey. As a result of what is essentially a one-sided marketing approach, the entire organization is likely to be flying blind when it comes to engaging its customers. 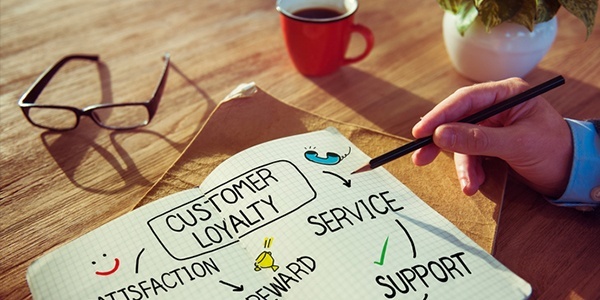 The company may not be sure which marketing channels are reaching customers, and probably isn’t consciously molding its operations to form a buying experience that its customers prefer. Content tends to be inconsistent, and market data limited or incomplete. That leads marketing and sales departments to have a limited sense of what works with target customers, and so the company ends up repeating the same old tactics and budgets from one year to the next. To get out of this rut, marketers need to make a concerted effort to gain customer insights and apply them within the organization. It’s all about laying the groundwork for increasing alignment later on. To advance, the uninformed marketer needs to start with marketing basics. Three key actions to take at this stage include creating a customer persona, conducting a content audit, and conducting a technology audit. Customer persona: One of the most helpful exercises for the uninformed marketer is creating a customer persona. Organizations can do this by analyzing market research along with the results of customer surveys to create a semi-fictional representation of its target customer. The hypothetical but realistic description includes such things as job title, job factors most important to them, what type of information the customer seeks, and how that information should be presented to build engagement. The value of this tool is that it helps the organization better focus its efforts concerning content, channels, and operations, in ways that match target customers. Content audit: For this exercise, the organization needs to take a close look at its content efforts, categorizing them according to factors like the content type, target audiences, and stage of buyer journey targeted. By assessing content in this way, organizations get a better idea of how well they’re currently addressing opportunities in the market through its content, and what efforts remain to be implemented. The benefit is helping an uninformed marketer visualize what messaging it has covered and what it hasn’t. Used with the customer persona, the audit can also indicate ideal customer needs that its content has so far neglected. Technology audit: Similar to a content audit, conducting a marketing technology audit is taking a systematic look at the marketing technology and sales technology tools an organization is using to handle specific functions across a range of channels. For example, the company might have selected specific tools to reach individual customers, to gain market insights, and to strategize content, and it may have delegated these tools for use across a range of specific channels such as email, paid media, and owned media. Viewing technology tools in this manner allows organizations to take a holistic look at the tools they’re using to engage connected B2B customers, with an eye to unexplored opportunities, duplication of effort, and whether or not the tools are integrated with each other. Having completed these steps, an organization should be well on its way to reaching the next level of the Digital Marketing Roadmap, known as the Informed Marketer. We’ll profile this group and describe its marketing tactical priorities in next week’s blog. Until then, for details on these and other tactics to build customer insights and organizational alignment, please get in touch.